In this project, make easy and versatile mitt-shaped paper hand puppets. 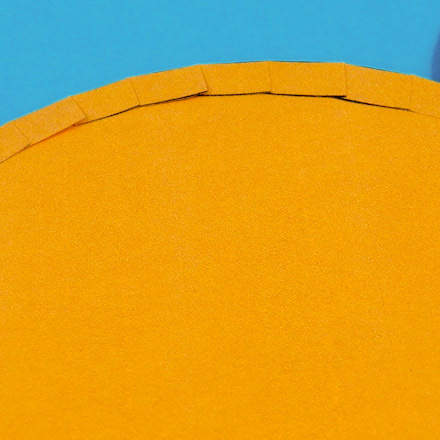 With the addition of features and a few cutouts, this simple mitt shape can be made into a wide variety of puppets—animals, people, monsters, even vehicles! For fabric versions of the cat, rabbit and bear puppets, see Cat and Rabbit Fabric Mitt Hand Puppets. Related crafts: For more puppets, many with plays based on folktales, see Puppets Around the World. Choose the puppets that you want to make. Download each pattern and print it on white paper. For the cat, rabbit, bear, "Guy" and "Sally" puppets, also print the puppet add-ons pattern for the ear and hair additions. Print the blank pattern to make a puppet of your own design, and use the eye expressions add-ons pattern to add some personality to your puppet. All of Aunt Annie's project patterns are designed to be printed on standard letter-size paper (8.5"x11" or A4). When printing from Adobe Reader, you may need to select Fit, Auto-Rotate and Center or Choose paper source by PDF page size to ensure the best fit. Color the puppet any colors you like. 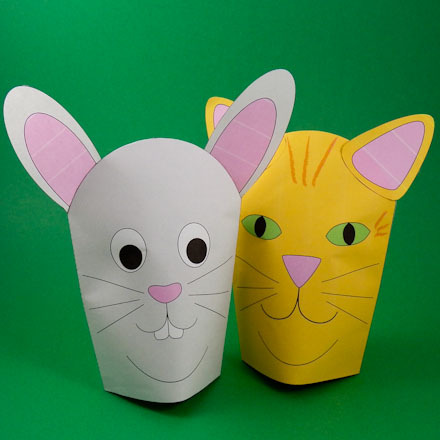 Add details to the puppets, like stripes on the cat or wisps of fur in the rabbit's ears. 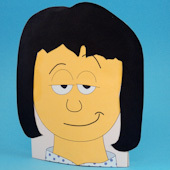 Use the blank pattern and your imagination to make puppets of your own design. Add some creative cutouts or use the silly eyes from Aunt Annie's eye expressions add-ons pattern. How about a monster or a fire-breathing dragon? A truck or car with wheel add-ons sounds like fun, too! Cut out each puppet and add-on part on the outside solid line. Be sure to make accurate cuts. The cat, rabbit and bear puppets have two ear add-ons and the "Guy" puppet has hair and two ears. Tip: If you choose to tape the mitt together, cut away the glue tabs by cutting the mitt on the solid black lines. To make the folding easier, score the center fold line and the glue tab fold lines on the mitt. Fold lines are marked in red. The mitt's top glue tab has a curved fold line. It is very important that this line is scored before folding! Tip: Use a ruler when scoring straight fold lines. Fold the side glue tab on the mitt, then fold the mitt in half on the center fold line. Unfold. Before folding the mitt's top glue tab, snip the glue tab every ¼" or so with a cut that ends at the fold line. Now fold and unfold each section of the glue tab on the scored fold line. The snipped sections will overlap. Apply glue along the back of the side glue tab. Fold the mitt in half and fold the glue tab over the mitt's back to close the mitt's side seam. To close the top seam, put glue on the back of each section of the top glue tab and fold over the back of the mitt. Let the glue dry. Tip: You can use tape in place of the glue and glue tabs. Fold a length of tape over the mitt's side seam and several small pieces of tape over the mitt's top seam. Cat: Glue the cat's ears to the front of the mitt, near the top. Rabbit: Glue the rabbit's ears to the back of the mitt near the top. Bear: Glue the bear's ears to the back of the mitt near the top, pointed tip down. Guy: Glue Guy's hair to the top of the mitt, then glue the ears on either side of his face. Of course, you could leave Guy bald, if you like! Slip the puppet over your hand and have some make-believe fun! Tip: The mitt-shaped hand puppet is very versatile and can be used as the basis for just about any character your play requires. 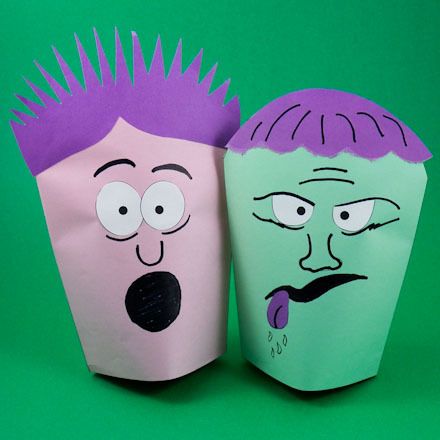 The "Guy" and "Sally" hand puppets in this project are examples of how easy it is to make a person with a bit of character! Tip: Use the blank hand puppet pattern to design your own puppets, like these ghoulish monsters! Tip: Use the eyes and facial expression drawings on the eye expressions add-ons pattern to make a puppet of your own design. 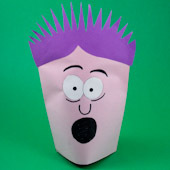 This monster is made with the "scared" eyes and a frightful expression with shocking hair! 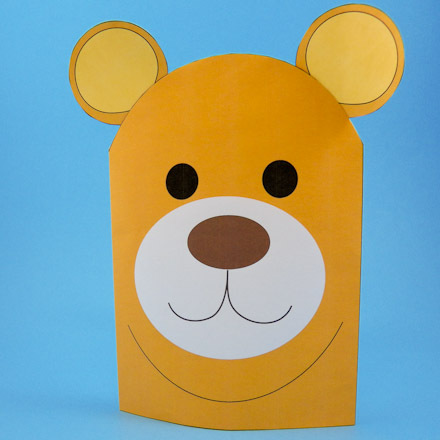 Tip: For the bear puppet, cut the two round ears from the add-on pattern and glue to the back of the puppet, as shown. Tip: Snip the top glue tab into sections. 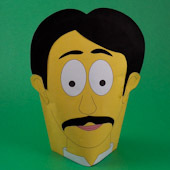 Fold the tabs over the top of the folded puppet, and glue to the back of the puppet. 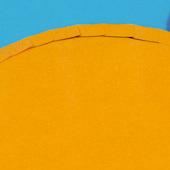 The cut sections will overlap.